Greetings from Austria! At around 4:30 in the afternoon we found ourselves marveling at the mountainous panorama of the Austrian region of Styria. Following a long drive from Friedrichshafen we reached our goal, the Red Bull Ring. 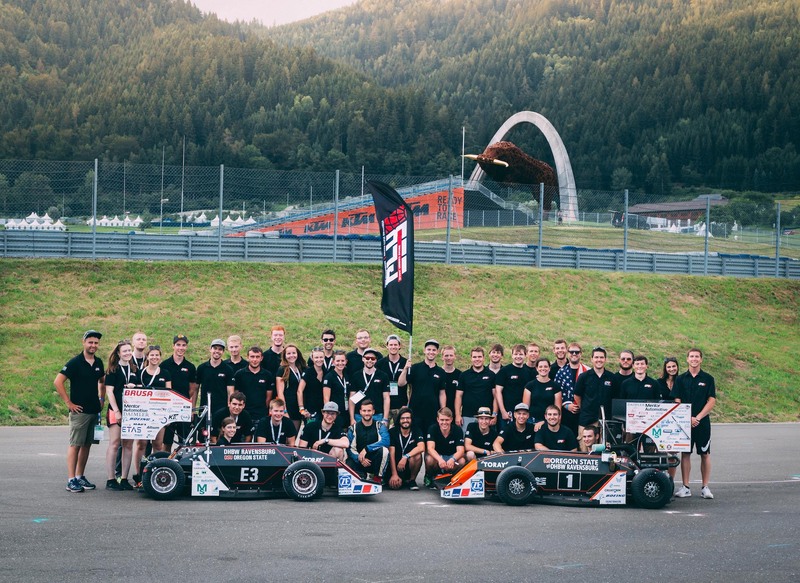 About 40 members made the trip, making GFR one of the biggest teams at Formula Student Austria (FSA). For those who were unable to attend Formula SAE Michigan FSA 2016 marks the first event of the year. Most of the cars reached the campsite at 5PM on July 31. Unfortunately, the journey didn’t proceed as planned for everyone – our new trailer, carrying our electric car, lost a few of its screws. Luckily enough, we noticed early and were able to prevent any accidents. After a short stay in a workshop we were able to continue our journey without damages. As the missing crafters and trailers finally arrived around 10pm, we were able to make dinner and arrange the campsite with the rest of the tents. After the turbulent journey, we all enjoyed our well-deserved barbecue. We went to bed, looking forward on the first day of competition! Austria! It was a wet evening last night setting up camp, but day one of competition is now underway! In all seriousness, our first day here at FSA has gone very well! The combustion car is the first to pass tech inspection and the electric car was close behind. In case you were wondering, our team member is not on fire, but rather practicing driver egress to make sure he can escape quickly if needed! Much better weather today in Spielberg and we’re up bright and early for the design and cost events! While waiting for the presentations to begin, we finally got both our cars together for a photo. 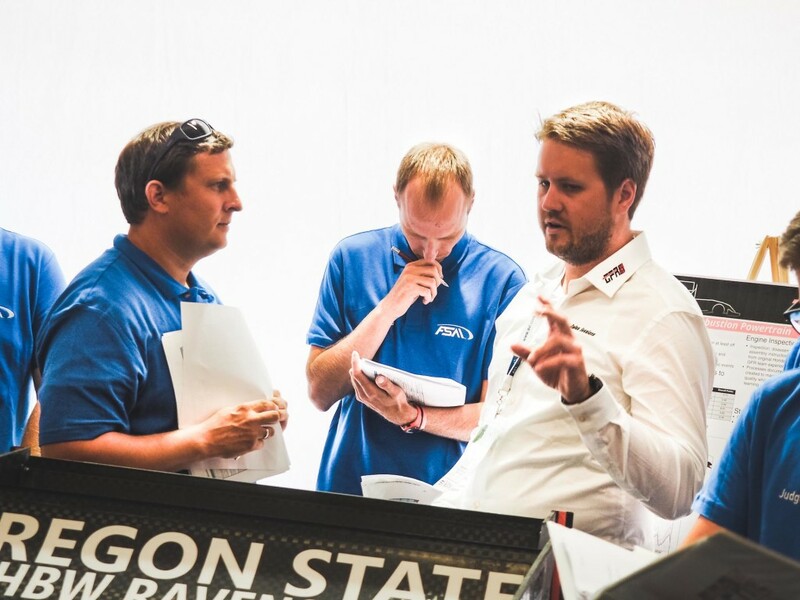 For the combustion car design events, we had nine kind judges ask us many difficult questions. All in all, we were satisfied by the end of the design presentations. The cost report and business presentations went very well for both cars.The business presentation took place later in the afternoon. As the combustion car had already passed scrutineering on Monday we decided to go testing while completing the last parts of scrutineering with our electric car. During testing, our exhaust began burning and we weren’t able to drive anymore. 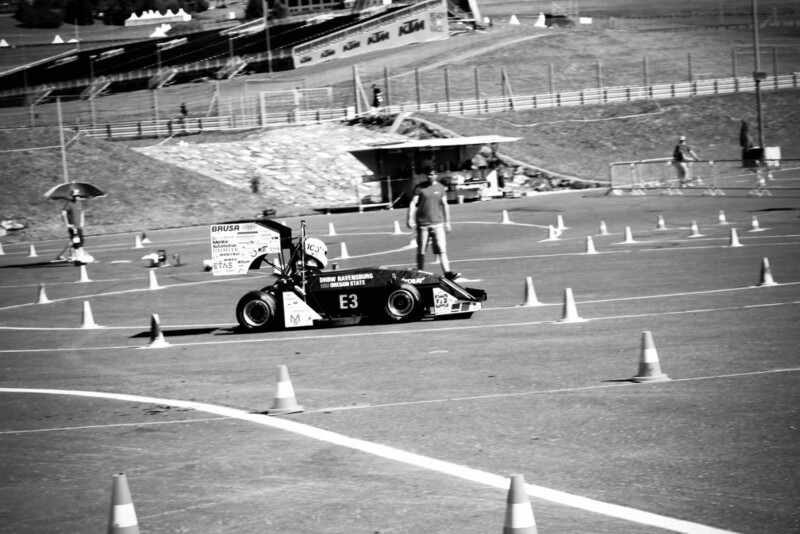 We tried very hard to fix our car in order to participate in acceleration and skid pad the next day. A very big thank you to all the teams for their tremendous help!!! A few team members were driving to the workshop of TU Graz. The guys of TU Graz were joining us and trying to fix our cCar in time. This was a hard night full of work for everyone. The third day of FSA began with the wonderful news that the cCar was repaired during the night, and it was ready to compete alongside the eCar in skidpad and acceleration. Both cars were able to finish respectably in each event. Late afternoon brought autocross, where the cCar finished with the second fastest time in the combustion class, and the eCar finished third in the electric class. We also found ourselves in the business presentation finals for the cCar, meaning a second presentation that the entire team was able to watch. 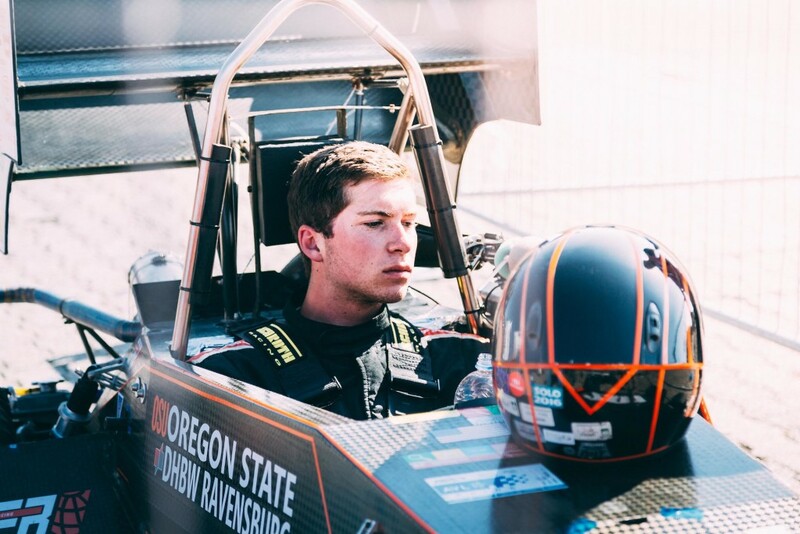 The first half of the awards ceremony had a positive ring for the team, and we were thrilled to find out that the cCar finished third in skidpad as well as business presentation. So ends another successful and eventful day for GFR. Today is the very last day of competition. 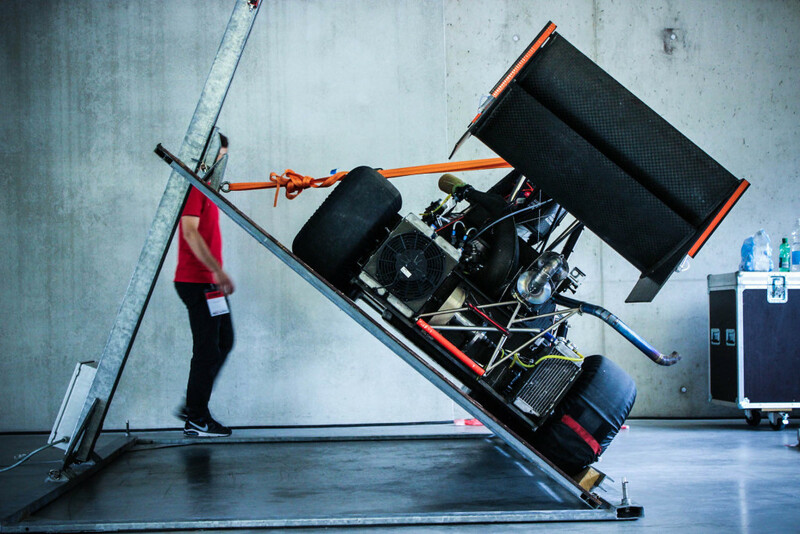 To be honest the time has ran very fast and we couldn’t imagine that Formula Student Austria will end by this evening. Today we had to pass endurance. Due to our good results in yesterday’s autocross we were lucky to start as one of the last cars. Obviously the whole team cheered for our drivers and were very nervous during the last competition. Immediately after our last run, we packed everything back to our crafters and trailers as the pit must be empty at 8 o’clock. While some of us were packing the trailers the rest of us prepared food at the campsite to be in time for the award ceremonies. At 20:15 pm finally the award ceremonies took place. We are happy to announce that we won the fuel efficiency award with the cCar, the third place in Energy Efficiency with the eCar, the third place in autocross for eCar and the 2nd place for cCar, the 2nd place for cCar Endurance, the third place in Skid Pad and the Business Plan Presentation for the cCar as well. This resulted in a 2nd place in overall combustion. We are very proud of our achievements and like to thank our sponsors and supporters for their engagement and support during the whole season!